Ever found yourself yearning for a job in the great outdoors? Spend a couple weeks swinging a splitting maul and stacking firewood or maybe take an extended ‘vacation’ to cut some logs for extra money and you’ll likely be proud to get back to your regular job – whatever it is. Excursions like those are just small reminders of what was required to work with timber in the 1800’s. While the tasks are still time-consuming, gone are the days when getting timber out of the woods was such a perilously arduous task. In stark contrast to the challenges faced by 19th and early 20th century loggers, today’s modern skidders, hydraulic operated lifts, tractor-trailer rigs and other machinery have increased efficiencies and significantly enhanced safety. 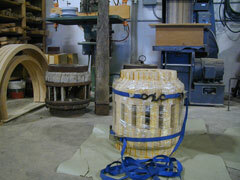 Over the centuries, one thing that hasn’t changed is the constant demand for the wood resource. According to sources at the University of Minnesota, our (U.S.) per capita consumption of wood continues to substantially rise. So significant is wood today that some stats show its use exceeds the combined weight of all metals, plastics, and Portland cement used. Replenishing this appetite for wood is reflected in the fact that tree planting in the U.S. now totals more than 2.5 million acres each year. Similarly, in the late 1800’s, wood was a vital and profitable commodity. But, unlike the 21st century, the 19th and early 20th centuries had other dilemmas. Beyond accessing and cutting down the huge virgin timber, just moving the wood from the remote forest floors could be especially tough. Rugged terrain coupled with long distances to mills, waterways and rails severely hampered progress. Ultimately, it was just the kind of burden that has always inspired men to rise to the challenge with determined innovation. So it was in 1875 when Silas Overpack of Manistee, Michigan crafted the first set of “Michigan Logging Wheels” or “High Wheels” as they came to be known. As the history is told, a decade or so after the end of America’s Civil War, Overpack was a wheelwright in Manistee. 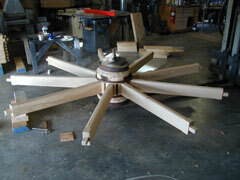 He was approached by a local farmer to build a set of 8 foot wheels. Sometime later, the farmer returned asking for an even larger set of wheels. Overpack’s curiosity got the best of him. Asking the man why he needed such large wheels, the farmer explained he was using them on a cart to skid logs. By 1893, Overpack was regularly manufacturing the high wheeled cart and actually displayed it at that year’s World’s Fair in Chicago. They were an immediate sensation and quickly caught on in the forests of the Pacific Northwest. To aid in supplying this extreme western part of the country, Overpack solicited the support of the Redding (California) Iron Works. Their proximity to the west coast timber industry helped overcome shipping issues and, ultimately, resulted in another innovation. As valuable as they were to timber companies, there was one problem with the big-wheeled machines… they had no brakes. In the relatively flat areas of Michigan, this wasn’t as much of an issue. But in the steep timber country of northern California, Oregon and Washington, it was a serious safety concern. 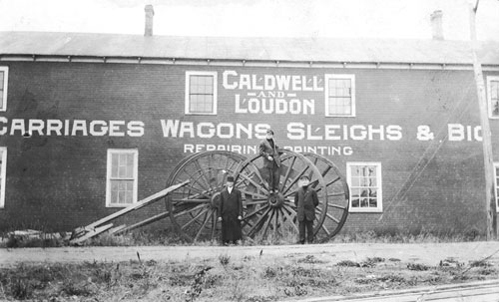 The owner of Redding Iron Works, John Webb Sr., came up with an ingenious solution. He developed a “slip-tongue” that allowed the cantilevered Jacob Staff (rod/lever system) to help lower the logs on downhill grades thus serving as a drag to slow the entire rig. 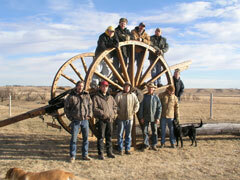 The High Wheels worked to lift the logs when the team of horses pulled on the tongue. As the horses moved forward, the tongue slid forward and also pulled the rod and lever, rotating the chain cams and raising the logs. 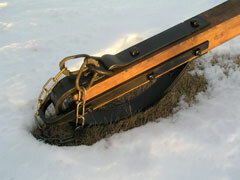 Going downhill, the cart would slide forward on the tongue, automatically lowering the logs back to the ground. 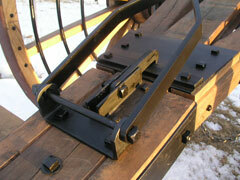 It was a very effective design that saved the lives of horses and men while greatly increasing productivity. Some time ago, a rare, dilapidated set of these wheels was given to Rogan Coombs of Fortuna, California. Sharing a long history with the timber industry, Coombs immediately made plans to add the wheels to a working museum he and a few friends had planned to open. According to Coombs, these High Wheels were made at the Redding Iron Works and were originally sold to the Weed Lumber Company for use in the big pine country of the Northwest. From the timber they hauled to the history they made, everything about the wheels had an imposing air; the colossal size of the hubs, the diameter of the massive wheels and the questions the piece, itself, brought to mind. It all combined to put the wheels of Comb’s own mind in motion. Ultimately, this scarce piece of timber history was enough to convince him to gather all the parts and investigate the possibilities of having the Big Wheels restored to their original glory. 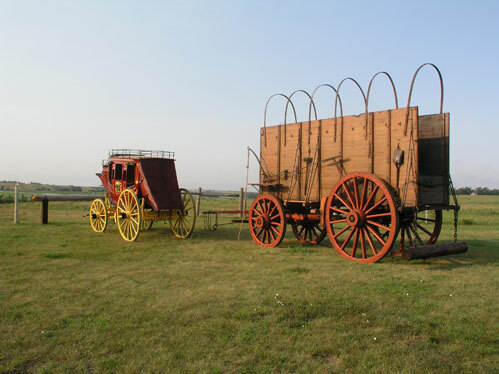 Relying on the noted western vehicle authorities at Hansen Wheel and Wagon Shop, Coombs had the decayed remains of his giant wood-wheeled skeleton shipped to Letcher, South Dakota. 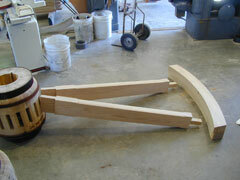 Once there, it fell to Hansen’s staff to not only restore the wheels, but help ensure their historical accuracy. Combing through vintage articles, photos and other primary source archives, Hansen is a perfectionist when it comes to matching history and 19th century craftsmanship. He describes it as being a little like an archaeologist looking for clues. After a year in Hansen’s shops, today the High Wheels again stand as a remarkable example of American ingenuity and achievement. 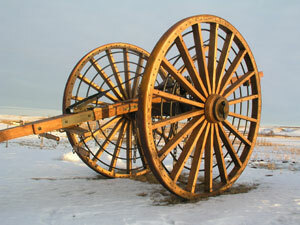 Weighing close to 3,500 pounds, this giant set of wheels sold for $350 a century ago. Today, it’s valued near $30,000. 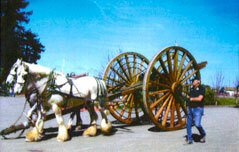 Rogan Coombs and his friends have already used the High Wheels in local California demonstrations and while the huge cart is still adept at moving timber, its impressive size is equally successful in stopping traffic. Big Wheels… High Wheels… Michigan Logging Wheels… whatever you call them, they still inspire, reminding each of us of a time when it took strong horses, determined men and the largest of wheels to make a living felling timber, load it on a cart and then get it all Out Of The Woods. Big jobs are nothing new for Hansen’s crew as they recently finished some conservatory work on one of Ketchum, Idaho’s huge freight wagons. As seen in the accompanying photo, this original 1880’s freighter literally dwarfs a reproduction, full size Concord Coach. This and five other freight wagons are part of a yearly parade and salute to Ketchum’s early mining history.